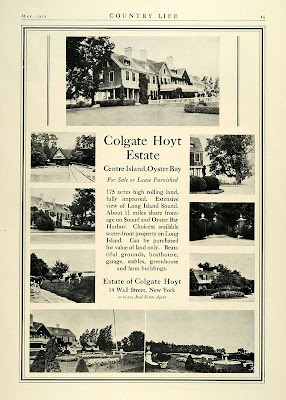 An advertisement for 'Eastover', the Colgate Hoyt estate designed by Renwick, Aspinwall & Owen c. 1891 on Centre Island. Click HERE for more on 'Eastover'. Ad from Country Life, 1923. "Can be purchased for value of land only." I wish more of these styles homes stood, they seem very comfortable to me. Off subject..house tour at Wereholm in Islip this weekend. 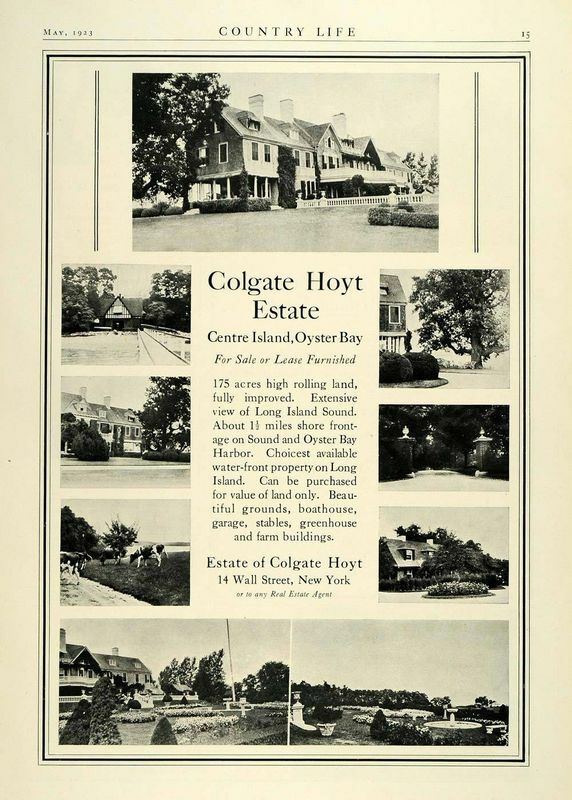 Timeline: this house was built in 1891; Hoyt died there in 1922; & in 1923 'Eastover' is for sale for just the price of the real estate -- my guess is 1923 plumbing & electrical expectations, plus changing tastes had left 'Eastover' behind. I wonder if someone bought 'Eastover' between 1923 & 1930 because being torn down in 1930 probably reflects this house was really undesirable during the Depression. Sad this house lasted only 40 years; all these McMansions should have such short life spans. I agree about the caulk, Ancient. I've also witnessed the use of particle board in construction in place of plywood or any natural wood & am a believer that the only acceptable use of particle board is in the construction of cheap furniture; anyone who uses it in the construction of a house doesn't care about that house (my opinion & I'm sticking to it ... even stronger than the "glue" used to make particle board). Heather, Zach has a contact icon right below his profile in the top right-hand corner. Imagine cows grazing on the grass on Centre Island now! Thanks for the heads up...am deleting that comment now. I'm not one to pitch a reality show on here, especially one I haven't seen before, but according to The Real Deal, tonight's episode of 'Selling New York' on HGTV at 9:30PM will include stops on Long Island (including possibly 'Templeton' II among others).